Paleo Blueberry Coconut Crumble Recipe. So that’s where the crumble idea came from. Not gonna lie… we’re pretty impressed with this super yummy, low in natural sugar, low in carb, low(er) in nuts than most crumbles, grain free, refined sugar free, gluten free recipe! Oh and it’s like the easiest recipe ever! All these ticks, how can we not be happy!? Ok we will stop rambling now. 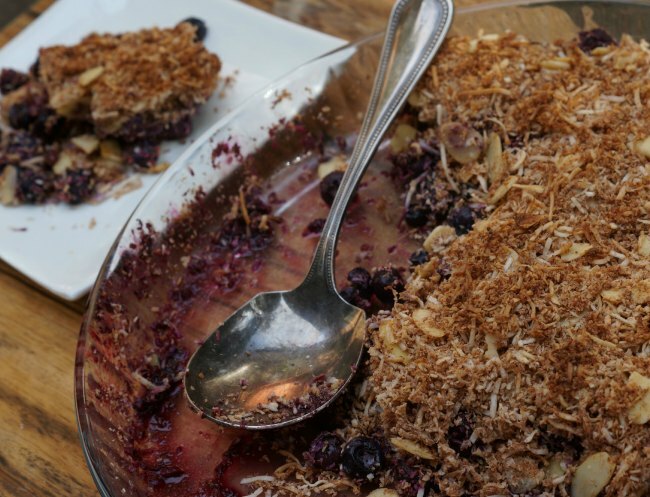 You should probably go and make our paleo blueberry coconut crumble. Yes, in fact we think it’s probably best to go make it right now. p.s. the oven just beeped, time for paleo blueberry coconut crumble! STOP THE PRESS! This recipe was so darn delish we just had to make a whole merrymaker mini eBook filled with low fructose sweet treats. YUM! In a bowl combine the shredded and desiccated coconut, flaked almonds, cinnamon and stir well. Add the melted ghee to the dry ingredients and mix until crumbly. Sprinkle the crumble mix evenly on top of the blueberries. Place into the oven for 10 minutes. Cover with foil and cook for another 15 minutes. Want to know more about fruit? We recommend this great read from 180 Nutrition.